George Winiecki updated us on our 40th Anniversary Party coming up on February 23rd, 5:30 PM at the New Brighton Community Center. He has 58 RSVP’s from current and former Rotarians and spouses. If you have not RSVP’d yet, it’s very important that you let George know ASAP so we can order the right number of meals. You all have received emails with a Gold Plate Dinner sales brochure and your GPD sales team assignments. Mark Beisswenger explained how the Gold Plate Dinner ticket sales contest will work. From February 12th – April 2nd, Rotarians who sold a ticket the previous week will receive one entry for a $75 grand prize drawing at the conclusion of the ticket sales competition. The members of the team with the most combined ticket sales for the previous week will each receive one entry for the $75 grand prize. The individual who sold the most tickets during the previous week will receive one entry to the grand prize drawing plus their choice of a bottle of wine, a six pack of craft beer or a $10 gift card. The Rotarian who sells the most tickets overall will receive $75 cash. To qualify for the sales competition each ticket sale must be confirmed by the buyer and reported to Mark Beisswenger. Also make sure to report the meal choice information for each ticket. Now get out there and sell tickets! Geoff Hollimon reminded us that our March 5th noon meeting will be off-site at the CPY Luncheon. A big Rotary turnout will show the community how strongly we support CPY’s youth mission. There is no cost to attend. Look for a sign-up sheet at next week’s meeting. · Our Arbor Day tree give-away is coming up on Friday, April 26th. Several volunteers will be needed to distribute the trees to area 4th graders. Mark your calendars now. · We need two host families for next year’s youth exchange. If your family or one you know is willing to host a student, please contact Ed right away. · We’re planning to have another Feed My Starving Children event sometime in May. We’ll pass the hat next week to gather some seed money for the event. 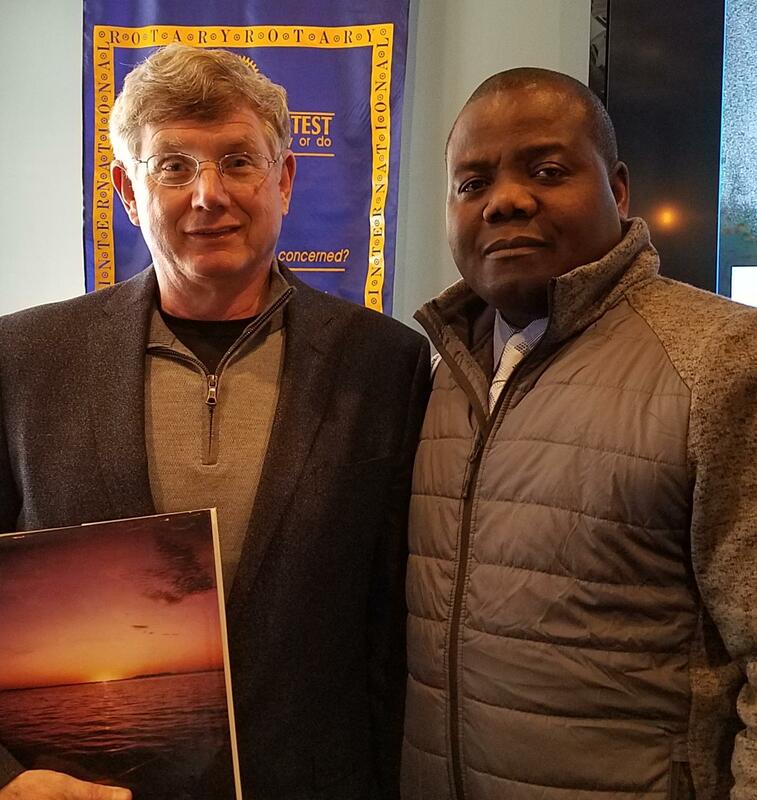 · Mark Beisswenger received a snow blessing from the Minnesota Twins Pastor earlier this year and the results have obviously been amazing. Word is Mark is lining him up for another blessing for next snow season. · Charlie L. is off to Mexico (without kids) for week with college friends. · Ed James’ fiancé will be here from England to help us celebrate our 40th anniversary. · Mary Stewart’s parents visited her last week and they were also able to help out at CPY. · Dave Hoel explained how easy it is to grind up your cell phone with your snow blower. Ed James introduced our speaker, Nyle Zikmund. Nyle’s topic was the Red River Expedition of 1870. Around the time of the U.S. Civil War both the U.S. and Canada wanted to encourage settlement of their interiors. Canada was still a British possession but it was working on independence and was trying to buy Ontario and Manitoba from the England’s Hudson Bay Company to create Canadian settlements there. The Métis, a group of people created by intermarriage of the native population and French voyageurs, feared that these new settlements would cause them to lose the land they had occupied but had no legal ownership of. This led the Métis, under the leadership of Louis Riel, to capture Fort Garry. Riel presided over the court martial and eventual execution of Thomas Scott. England responded by dispatching 1,200 British Soldiers and 2,000 native guides and porters, led by Colonel Garnet Wolseley, to quell the rebellion. At that time there few roads so the expeditionary force would need to paddle most of the way. Wolseley and his men faced a most difficult journey, traveling from 3 in the morning until after dark and all the while plagued by ravenous mosquitoes. Despite grueling conditions, they covered 370 miles in just 90 days, but were unable to engage Riel and the Métis because they had fled Fort Garry to avoid a battle with the clearly superior British forces. Both Riel and Wolseley went on to be prominent historical figures. Ed and Nyle are shown below.